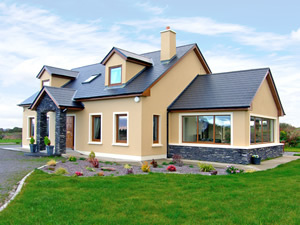 Beaufort in Ireland-South is a perfect choice for a great holiday or a fun short break in County Kerry. Find out more about Beaufort below. This fabulous new property is located at the foot of the Macgillycuddy Reeks and Carrauntoohil, 3.5 miles from Killorglin, 6 miles from Beaufort and the Gap of Dunloe. It is decorated with exceptional taste offering a sophisticated yet homely feel. The setting is truly idyllic with breathtaking mountain views and rolling countryside. An ideal touring base for the south west with the Ring of Kerry, Dingle Peninsula and Killarney all nearby . Also further afield day trips to the Beara Peninsula and Cork.Pub. Restaurant 3Ã‚Â½ miles. Beach 15 miles. GF: lounge, kitchen/diner, utility room, sun room, double, bathroom with separate shower. FF: kingsize double with ensuite shower room, twin with ensuite shower room, gallery.Oil by meter read and electricity by meter read, linen and towels included, No Smoking, flame effect fire, cot, high chair, TV, dvd player, radio, CD, fridge with small ice box, microwave, dishwasher, w/machine, dryer, welcome pack, fully enclosed garden, garden furniture, off road parking. Pets welcome.